Obituary – Meshek, Carolyn Sue (Kirkhart) « Perry High School Alumni Association, Inc.
﻿Carolyn Sue Meshek, 42, Bartlesville, formerly of the Lucien community, died at 1:45 a.m. Wednesday at Jane Phillips Medical center at Bartlesville. Funeral will be at 10:30 a.m. Friday at the First United Methodist church at Bartlesville. Officiating will be Jerry Perryman, United Methodist district supervisor from the Clinton area, and Dr. Ray Owen, pastor of the Bartlesville church. Another service has been planned for 3 p.m. Friday at the United Methodist church at Lucien. Burial will be at Grace Hill cemetery at Perry under direction of Stumpff Funeral home of Bartlesville. Memorials may be made to the American Cancer Society, in care of Mary Byrd, Plaza National Bank, Post Office Box 3218, Bartlesville, Okla. 74005; the First United Methodist church, Post Office Box 1136, Bartlesville, Okla. 74005; or the Lucien United Methodist church. 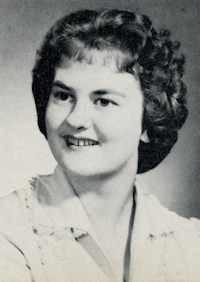 Mrs. Meshek, daughter of Dale and Betty (Johnson) Kirkhart, was born at Enid, Sept. 27, 1943. She received her education at Lucien, Perry and Central State university at Edmond. She also attended secretarial school for two years. She and Harry Meshek were married Aug. 22, 1963, at Lucien and they made their home in Perry. Mrs. Meshek was a bookkeeper at Farmers Cooperative Exchange in Perry until 1967. The Mesheks lived in Oklahoma City, Pauls Valley and Ponca City while Meshek was an employee of Phillips Petroleum and had lived in Bartlesville since December, 1968. Mrs. Meshek had been an employee of Phillips Petroleum and in recent years had been associated with Metropolitan Insurance company. She had been in ill health two years. She was a member of the First United Methodist church of Bartlesville and a Child Study club. In addition to her husband, of the home, survivors include one son, Chad, and a daughter, Cara Dale, both of the home; her mother, Betty Kirkhart, Perry; an uncle, C. R. “Buck” Johnson, Perry; and four aunts, Bertha Kemnitz, Orlando; Mabel Kirkhart, Lucien; Lela Kirkhart, Enid; and Mary Kirkhart, Santa Fe, N.M.
She was preceded in death by her father in November, 1983. Memorials may be made to the American Cancer Society, in care of Mary Byrd, Plaza National Bank, Post Office Box 3218, Bartlesville, Okla. 74005; the First United Methodist church, Post Office Box 1136, Bartlesville, Okla. 74005; or the Lucien United Methodist church.